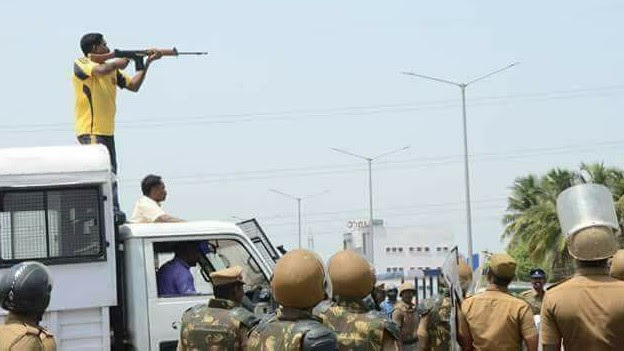 Caption: A police officer takes aim at unarmed protesters in Tuticorin, Tamil Nadu. Image courtesy New Indian Express. South Asians for Human Rights, a regional network of human rights defenders, unequivocally condemns the brutal excessive force used by police in Tamil Nadu to dispel unarmed people protesting against water and air pollution. On 22 May, protesters in Tuticorin, Tamil Nadu marked 100 days of continuous protest against the expansion of a plant owned by Sterlite Copper – a subsidiary of Vedanta. Protesters have opposed the plant for over 20 years due to pollution and environmental destruction. In 2013, the Supreme Court fined the plant was INR 1000,000,000 for environmental rehabilitation. Media reports allege that the protests turned violent as police vehicles were set on fire. Tamil Nadu police responded with brutal and excessive force. First, they lathi charged the crowd indiscriminately, and later, fired live rifle rounds into the crowd from afar. Killing at least 11 and leaving dozens injured. It is SAHR’s position that the police have acted with excessive violence and urges the relevant authorities to launch an immediate and impartial investigation. All officers involved in suppressing the 22 May protest should be suspended and until those responsible for making and carrying out the shooting orders are brought to book. As of writing this statement, SAHR notes that violence and instability are continuing to unravel in Tamil Nadu. Authorities must take all necessary measures to reign in use of force and respond to the grievances of protesters in a democratic and reconciliatory manner.